I have a box where I store activity books, art supplies, small toys and cars and other items that I regularly pack in our carry-on luggage. I find it easier to purchase activity books or print out activity sheets in advance. I pack at least two activity books in our carry-on and for long trips, I’d recommend having a couple more in your suitcase so you have “fresh” material during your holiday and on the return flight. First, there are a load of free resources online to print out colouring and activity sheets and I now have a Pinterest board with plenty of “Free Printables” – scissor practice sheets, colouring pages and various activity sheets. 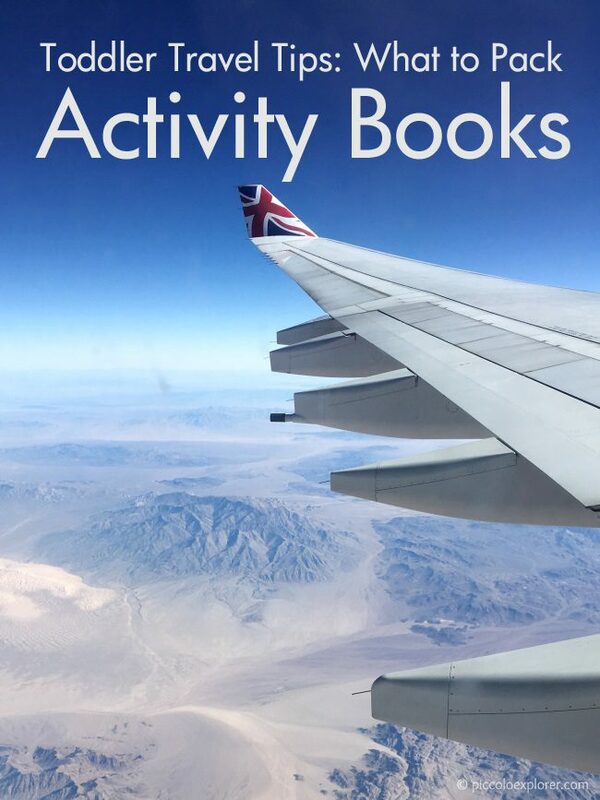 And here are our favorite activity books that I’ve purchased myself since Little T was about 12 months old, great to bring on your next holiday. 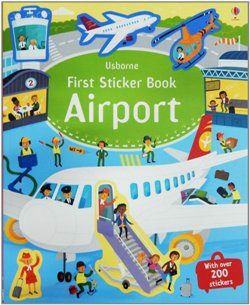 First Sticker Book Airports (First Sticker Books) – The previous version of this sticker book was our first to bring on holiday and we’ve since gone through at least three, including one of the current version which has a nice, updated look to it. 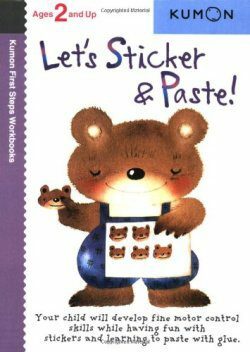 We have quite a few Usborne sticker books; there’s a great selection in their “First Sticker Book” series to choose what your little one would enjoy most (i.e. Cars, Diggers, Princesses, Animals, Under the Sea), and even some location-specific ones, like London and Paris. 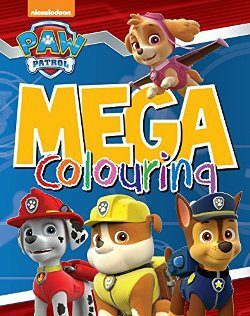 Nickelodeon Paw Patrol Mega Colouring – I find the Mega Colouring books (we also have the Mickey Mouse one) a good value – this Paw Patrol one is £3.99 for 96 pages to colour including a few matching activities. 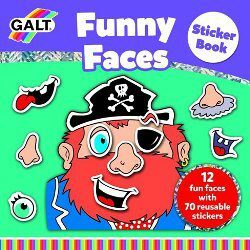 Galt Toys Funny Faces Sticker Book – Having gone through many a one-time use sticker book, it’s always great to find a book that comes with reusable stickers. This one by Galt Toys is also handy as it’s a small size (210 x 210mm) and easy to fit in most mini backpacks and handbags. Little T had fun picking out the eyes, ears, noses and mouths for various faces which include a queen, pirate, snowman and scarecrow. 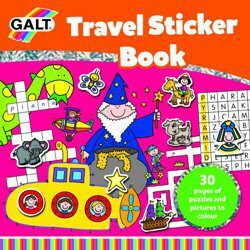 Galt Toys Travel Sticker Book – Again, thanks to its small size, this book is convenient to pack in my handbag. There is plenty that keeps Little T busy, starting with coloring and stickers but also activities such as “count the bats”, “spot the circles”, “find the animals” and “odd one out”. 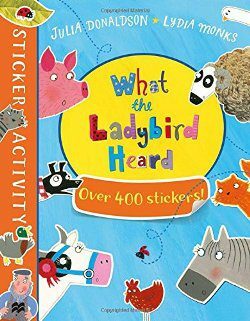 The What the Ladybird Heard Sticker Book – Ccurrently reduced on Amazon (£2.99 from £5.99), this book is an excellent value considering that’s the average price of a kid’s magazine and you get more out of this one. Other Sticker Activity books featuring the characters of Julia Donaldson’s books that are on sale as of this writing include My First Animal Fun Sticker Book and The Smartest Giant in Town Sticker Book. 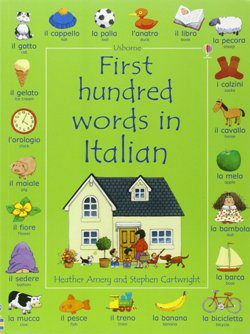 First Hundred Words in Italian (Usborne First Hundred Words) – This book is great to bring along on a flight to point out objects on scenes from around the home to the playground to at a shop, to learn new words (also in a foreign language) and to look for a little duck that’s hidden on each page. There are also English, French, Russian, Spanish and Chinese versions of this book available on Amazon, as well as First Thousand Words books in various languages – again we have the Italian version and I highly recommend it. 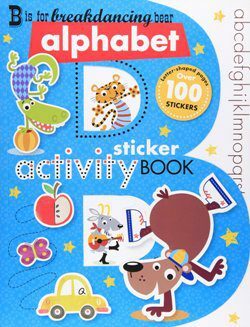 B Is for Breakdancing Bear Alphabet Sticker Activity Book – With 110 pages, this book is about twice the thickness of the typical activity book but packs a lot into it: each letter of the alphabet has a letter-shaped page for your little one to trace with a finger along with sticker, drawing and coloring activities. Let’s Sticker & Paste! (Kumon First Steps Workbooks) – Art supplies I bring on flights include child-safe scissors and a glue stick. We have two other Kumon workbooks (Let’s Cut Paper! and Let’s Fold!) and I chose them to try something different for long haul flights – the exercises help pass the time while Little T learns new skills. Each workbook starts off very easy, for example this one begins with sticker scenes, then the exercises progressively become more difficult, like pasting four squares to create an image. The scissors we use are the Melissa & Doug Child Safe Scissor Set (2-Piece) and while we’re on the airplane, I have a bag ready to put away any scraps of paper. You could also, of course, use an activity sheet (there are some scissor practice sheets on my Pinterest board) or any magazine for your little one to practice cutting with the scissors, around particular objects or along lines and boxes. 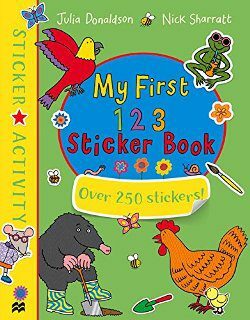 My First 123 Sticker Book – Another great sticker activity book based on the picture books by Julia Donaldson that features games, jigsaws and colouring for learning to count from one to ten. We’ve been practicing numbers and I recently purchased this book for our upcoming trip to Spain. This book is half price on Amazon (£3.00 from £5.99) which is really a great value as it’s a good quality book with plenty to do and of course loads of stickers. My Things That Go! 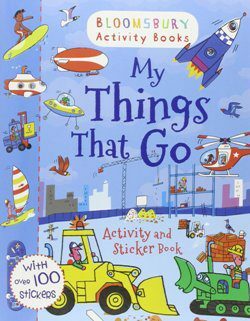 Activity and Sticker Book (Activity Books for Boys) – This is another one with a reduced price on Amazon (£3.00 from £4.99) that I recently purchased for our trip to Spain. Little T found my new stash and loved the fun illustrations and mix of activities of this one – and of course all the cars, diggers and trains. Do you have any activity books you’d recommend for traveling with a toddler? Or what are your favorite activities for a long haul flight? Let me know in the comments! Disclosure: This post contains affiliate links, so if you do click through and make a purchase I may receive a small amount at no extra cost to you. Thanks for your support! I was searching about Piccolo Explorer books (I have many good memories about those books from my childhood, especially Exploring the Age of Dinosaurs which I am crazy about) but I stumbled upon this page! Nice blog, by the way. But I am really curious, why did you choose this particular name? Wow it’s funtastic book, fullcolor and goodloking. This book can make everyone interest to read, and make toddler easy learn every theme of this book.